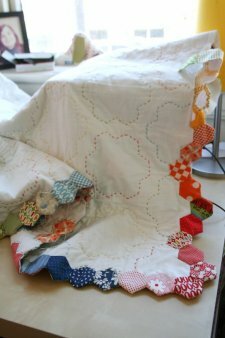 "After posting photos of my hexagon quilt border progress on flickr, I had a few requests for a tutorial. 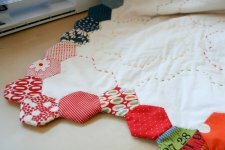 I suppose this is the long overdue part 2 of my english paper piecing tutorial that never made my sidebar for some odd reason. Probably and very likely due to the vast spelling errors throughout. I'll fix that soon too! "I am calling this the border method. It gives your quilt with a hexagon shaped border instead of straight binding. It also means you don't need to make partial hexagons to square up your sides. It could equally be called the why am I torturing myself with even more hexies method."